Thanks to their discreet, geometric shapes and their diversity of variations the Keramag Preciosa wash basins harmonize with every style. Here it is true to say "the round merges with the square", because all Keramag Preciosa wash basins have a round basin. The outer shape is squared with clear edges and offers extra space for bathroom accessories thanks to practical shelves, regardless whether you have opted for a Keramag Preciosa double wash basin or a small Keramag Preciosa wash basin with 60 x 55 cm. The round Keramag Preciosa built-in wash basins, which are available in many different dimensions are especially popular. 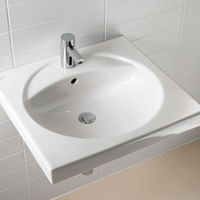 So these wash basins are available in 38 cm – 50 cm, ideal for any bathroom situation. In addition, you will find the matching Keramag Preciosa bath tubs at skybad.de.